Late blight, which is caused by the pathogen Phytophthora infestans, is one of the most destructive and contagious plant diseases. Total crop loss is not unusual, especially if management practices are not used, because the pathogen directly affects fruit and kills plants. Disease progresses quickly under humid conditions, which are favorable for the pathogen, particularly when accompanied by cool temperatures plus rain, heavy dew, or fog. Late blight has been likened to wildfire by those whose plants have been afflicted. The pathogen produces an abundance of spores that are easily dispersed several miles by wind (up to 30 miles is possible). 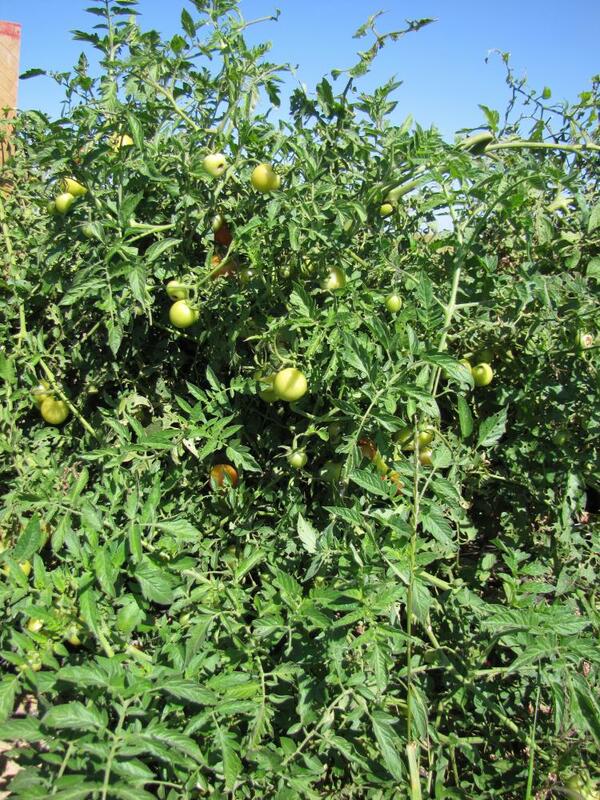 With such a contagious and destructive disease, not effectively managing late blight, even in a small garden, can have a detrimental impact on other tomato and also potato plants in farms and gardens. Late blight clearly is unlike many other diseases and cannot be “lived with”. Late blight damage on fruits and leaves. Photo credits: Margaret T. McGrath, Cornell University. For more information on identifying late blight, see the eOrganic video Identifying and Scouting for Late Blight on Organic Farms. Selection of resistant varieties is the best strategy for managing late blight. Late blight is most effectively managed with practices implemented before the disease starts to develop, or at the first sign. Unlike people and animals, plants cannot be cured of a disease, and there are no medicines (e.g. fungicides) that can make the symptoms disappear. With resistant varieties, the management practice is in place before late blight starts to develop. This is important, since late blight is nearly impossible to manage with fungicides under very favorable conditions for the pathogen. Knowledge about the genetics of resistance in a variety, and about the pathogen genotypes (strains) occurring enables a more accurate prediction of the level of control achievable with specific varieties. Major-gene resistance is the most common type of resistance available for many diseases, including late blight. Major-gene resistance is easier to breed for than minor-gene resistance, and the degree of pathogen suppression is usually higher. However, because major-gene resistance is usually specific to one pathogen genotype, it is less durable (more easily overcome by that pathogen). Major resistance genes correspond to specific virulence genes in the pathogen. Thus a resistance gene can provide very effective control of one pathogen genotype while being ineffective against another. Ability of the pathogen to overcome major-gene resistance often with a simple genetic change (thereby creating a new genotype) renders this type of resistance less effective over time. With some pathosystems, including late blight, several major resistance genes and pathogen genotypes have been identified. For late blight, there are four major resistance genes in tomato and 24 genotypes of the pathogen identified in the United States as of 2014. The tomato resistance genes are Ph-1, Ph-2, Ph-3, and Ph-5 (Table 1). Another, Ph-4, was identified in Asia. These were derived from Solanum pimpinellifolium, a wild relative of tomato (Solanum lycopersicum). These genes are effective against some genotypes but not others. Ph-1 is not effective against the main genotype found recently in the United States (US-23). From left to right: Tomato varieties 'Mountain Fresh', 'Mountain Merit' and 'Mountain Magic' on 9/20/13. Photo credits: Margaret T. McGrath, Cornell University. Genotypes of the late blight pathogen are named US-1 to US-24, with higher numbers assigned to those discovered most recently. Some of these (including US-22 and US-23) are more virulent (aggressive) on tomato than many of the first genotypes identified in the United States that were more virulent on potato (notably US-1 and US-8, which occurred in succession as the only genotypes found for many years). Presence of US-22 and US-23 is a primary reason why late blight has become a more important disease of tomato in recent years, especially in the Northeast. US-17 only infects tomato. US-24 is more virulent on potato than tomato. Genotypes of the late blight pathogen are being monitored in the United States. This information is valuable to guide selection of resistant varieties. While it is logical to expect genotypes common in one year to be more likely to occur the following year and in the same area, this has often not been the case. Phytophthora infestans can be moved long distances in plant material—especially potato tubers—which is primarily where this pathogen survives between growing seasons. Therefore, it is prudent to know what genotypes have been occurring throughout the United States and not just locally. Table 3 lists the genotypes detected since 2002, and Table 4 has information listed by state of samples processed from 2010 to 2013. US-23 was the most common genotype in 2012 and 2013. Additionally, there is a list of recent genotypes available online that contains more information about them (www.usablight.org/node/52). With current technology, it is possible within a few days to determine the genotype of the pathogen affecting a specific plant sample. Genotypes determined for samples submitted through the USAblight project are posted with the USAblight Late Blight Occurrence Map (www.usablight.org/map). Click on a location in the list on the right side of this page to obtain information about the sample(s) submitted from this location. Monitor this site during the growing season to know when late blight has been confirmed near you, and to determine whether the genotype(s) detected will be controlled by resistant varieties you planted. If a genotype detected will not be controlled, be prepared to rely more heavily on organic-approved fungicides during the season. Sign up to receive alerts (www.usablight.org) for immediate notification when late blight is confirmed near you. Key to successfully managing late blight is growing resistant varieties as one component of an integrated management program. No resistant plant variety is immune, thus some symptoms will develop even on the most resistant variety under high disease pressure. 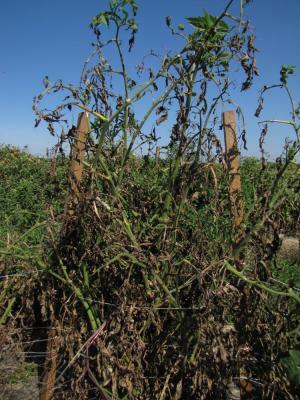 Briefly, other practices for managing late blight include destroying potential sources of the pathogen, applying fungicides preventively, routinely and thoroughly inspecting plants for symptoms, and monitoring the occurrence of late blight and genotypes of the pathogen (usablight.org). Certified organic operations need to be sure any fungicides are an approved input (see eOrganic article Can I Use This Input On My Organic Farm?). Additionally, take steps to contribute to community management of late blight by reporting suspected occurrence to local extension staff (http://nifa.usda.gov/partners-and-extension-map) or plant clinic (www.npdn.org/), notifying others growing tomato and potato near you when you have late blight, and promptly destroying affected plants when late blight cannot be managed. Much more information about managing late blight can be found in the eOrganic articles Organic Management of Late Blight of Potato and Tomato and Organic Management of Late Blight of Potato and Tomato with Copper Products. Ineffective against US-23 in replicated trials. Ineffective against US-7, US-11, and US-17 in laboratory studies. Moderately effective against US-23 and US-24 in replicated trials. Ineffective for US-22. Effective against US-11 and US-17 while ineffective against US-7 in laboratory studies. Good efficacy for US-23 and very good efficacy for US-11 and US-17 in replicated trials. Observed effective for US-22 when the pathogen was occurring naturally, but ineffective when inoculated; also ineffective for US-24. Very good efficacy against US-23 in replicated trials. Expect similar results with US-11, US-17, and US-22. Very good to excellent efficacy against US-23 in replicated trials. Expect similar results with US-11, US-17, and US-22. Very good efficacy against US-23 in replicated trials. No commercially available varieties yet. Table 2. Late blight resistant tomato varieties listed based on performance and fruit type with the most effective in the first section. Comments about resistance are primarily based on results from replicated experiments conducted with field-grown plants. Results also included from research with detached leaflets conducted under laboratory conditions. Some observations are mentioned. Stellar red slicer Ph-2 + Ph-3 (both heterozygours) Totally Tomato Very good resistance expected. also has intermediate resistance to early blight and Septoria leaf spot. Iron Lady red slicer Ph-2 + Ph-3 (both homozygous) High Mowing Organic Seeds Very good resistance to US-11, US-23, and US-24. Similar expected with some other genotypes, including US-17 and US-22. New variety in 2013. Defiant PHR red slicer Ph-2 + Ph-3 (both heterozygous) Johnny's Selected Seeds Very good resistance to US-11, US-23, and US-24. Similar expected with US-17 and US-22. Mountain Merit red slicer Ph-2 + Ph-3 (both heterozygous) Seedway Very good resistance to US-23 and US-24. Similar expected with US-11, US-17, and US-22. Plum Regal red plum Ph-3 (homozygous) Seedway Good but variable resistance to US-23; sometimes ineffective. Very good resistance against US-11 and US-17. Observed effective for US-22 when occurring naturally, but ineffective when inoculated (lab); also ineffective for US-24 (lab). JTO- 545 red plum Ph-3 Johnny's Selected Seeds Good resistance to US-23. Similar expected with US-11, US-17, and US-22. Mountain Magic red campari Ph-2 + Ph-3 (both heterozygous) several Very good resistance to US-11, US-17, and US-23; also effective to US-22, US-23, and US-24 in lab. Matt's Wild Cherry (S. lycopersicum var. cerasiforme) small red cherry unknown, Ph-3? From Mexico several Very good resistance to US-17, US-23 and US-24. Observed effective to US-22 in field. Effective to US-22, US-23, and US-24 in lab. Some resistance of foliar symptoms; excellent fruit resistance to US-8 and US-11. Cherry Bomb red cherry unknown Johnny's Selected Seeds Very good resistance to US-23. Larger than Jasper. Jasper red cherry unknown Johnny's Selected Seeds Very good resistance to US-23. Lemon drop yellow cherry unknown Totally Tomatoes Very good resistance to US-23 and US-24. Some resistance to US-11. Mr. Stripey (aka Tigerella) heirloom unknown several Fairly good resistance to US-23. Observed effective for US-22. Pruden’s Purple heirloom unknown Johnny's Selected Seeds Good resistance to US-23. Moderate resistance to US-24 and US-17. Some suppression of foliar symptoms, not fruit, with US-8 and US-11. Resistance to US-22, US-23 and US-24 (lab). Wapsipinicon Peach yellow peach unknown Totally Tomatoes Good resistance to US-23 and and US-24. Very good resistance to US-22, US-23, and US-24 (lab). Clou OP yellow campari unknown Good resistance to US-11 and US-24. Golden Currant yellow cherry unknown Very good resistance to US-24 and good to US-11. Resi red cherry unknown Very good resistance to US-11 and US-24. Rote Murmel small red cherry unknown Very good resistance to US-11 and US-24. Rote Zora small paste unknown Very good resistance to US-24 and good to US-11. Heinz 1439 red slicer unknown Limited resistance to US-23; Variable, sometimes ineffective. Legend OP red slicer Ph-2 (homozygous) several Limited resistance to US-23*. Ineffective for US-11, US-22, and US-24. *Variable, sometimes ineffective. Ineffective to US-22, US-23, and US-24 in lab. West Virginia 63, OP red slicer Ph-2 several Ineffective when tested against US-23. Source of Ph-2 gene. New Yorker, OP red slicer Ph-1 Totally Tomatoes Ineffective for US-11 and US-23. Ineffective against US-7, US-11, and US-17 in lab. Source of Ph-1 gene. Juliet plum South Asia, Ph gene(s) likely several Ineffective for US-23. Intermediate resistance for US-17 and US-22. Some suppression of fruit symptoms with US-8 and US-11. Ineffective for US-22, US-23, and US-24 in lab. Red Currant, OP (S. pimpinellifolium) cherry unknown Good resistance to US-17. Some suppression of fruit symptoms with US-8 and US-11. Yellow Currant (S. pimpinellifolium) cherry unknown Excellent tolerance for US-17. Some suppression of foliar and fruit symptoms with US-8 and US-11. Yellow Pear, OP cherry unknown Excellent tolerance for US-17. Red Pearl grape unknown Johnny's Selected Seeds Ineffective for US-23 and US-24. Intermediate resistance to US-22. Aunt Ginny’s Purple heirloom unknown Reimer Seeds Ineffective for US-23 and US-24. Good resistance for US-17. Aunt Ruby’s German Green heirloom unknown Seed Savers Exchange Moderate resistance to US-17. Ineffective for US-24. Big Rainbow heirloom unknown Burpee Observed effective for US-22. Ineffective for US-24. Black Krim heirloom unknown Botanical Interests Moderate resistance to US-17. Mixed response to US-22. Ineffective for US-24. Black Plum heirloom unknown Seeds of Change High resistance to US-17. Ineffective for US-24. Brandywine heirloom unknown Seed Savers Exchange Ineffective for US-23 and US-24. Moderate resistance to US-17. Slava heirloom unknown Reimer Seeds Some resistance reported to US-17. Ineffective for US-24. Ineffective for US-22, US-23, and US-24 (lab). Stupice heirloom unknown Irish Eyes Some resistance reported to US-17. Ineffective for US-24. * Varieties susceptible to US-11 in experiments with resistant varieties: Celsior, Centennial, Cerise Gelb, Dorada, Japanese Trifele Black, Paprika Formige, Primavera, and Tiffen Mennonite. * Varieties susceptible to US-23 in experiments with resistant varieties: Amish Paste, BHN1009, Charger, Florida 47, FL 8059, FL 8111, Golden Sweet, Green Zebra (lab), H3402, H9704, H9780, Monsanto AB2, Mountain Fresh Plus, Primo Red, Red Bounty, Red Deuce, Red Pearl, Rockytop, Scarlet Red, Sungold, Tasti Lee, and Totally Tomatoes Roma (lab). * Varieties susceptible to US-24 in experiments with resistant varieties: Better Boy, Centennial, Green Zebra, Mashenka, Moonglow, OR Star, Peron Sprayless, Roma, Sugar Sun, Tiffen Mennonite, Tigerella, and Wisconsin 55. * Varieties susceptible to US-22, US-23, and US-24 in laboratory experiment with resistant varieties: Green Zebra and Roma. Table 3. Genotypes of Phytophthora infestans occurring recently in the United States. See Table 4 for details on occurrence. US-8 A2 Common in potato. Almost exclusively occurs on potato. Was the only genotype found in the United States for years. US-11 A1 Found recently in CA, FL, NC, NY, OR, and WA. US-20 A2 Occurs exclusively on tomato. Found recently in NC and FL. US-21 A2 Occurs exclusively on tomato. Found recently in NC and FL. US-22 A2 Common in 2009, caused the Northeast pandemic. Develops best on tomato. Not as aggressive as US-23. Last detected in 2012 (one isolate found in NY). US-23 A1 Common in 2012 and 2013, especially in the Northeast. First found in 2010. More aggressive than others, especially on tomato. US-24 A1 Almost exclusively occurs on potato. Found recently in CO, ME, MN, MT, NC, ND, NY and OR, and WA. If there is no entry for a state in a year, it does not mean late blight did not occur there. Information about late blight occurrence is needed for states with no entries. * Number of reports included when pathogen genotype not determined for samples from all late blight occurrences. Hansen, Z. R., and Smart, C. D. 2013. Tomato variety trial for resistance to late blight, 2012. Plant Disease Management Reports 7:V090. Kim, M-J., and Mutschler, M. A. 2006. Characterization of late blight resistance derived from Solanum pimpinellifolium L3708 against multiple isolates of the pathogen Phytophthora infestans. Journal of the American Society for Horticultural Science 131(5):637–645. (Available online at: http://journal.ashspublications.org/content/131/5/637.full.pdf+html) (verified 4 March 2015). Inglis, D., Gundersen, B., Derie, M., and Vestey E. 2001. Evaluation of tomato germplasm for resistance to late blight, 2000. Biological & Cultural Tests 16:PT77. (Available online at http://dx.doi.org/10.1094/BC16) (verified 7 March 2015). McGrath, M., and S. Menasha. 2013. 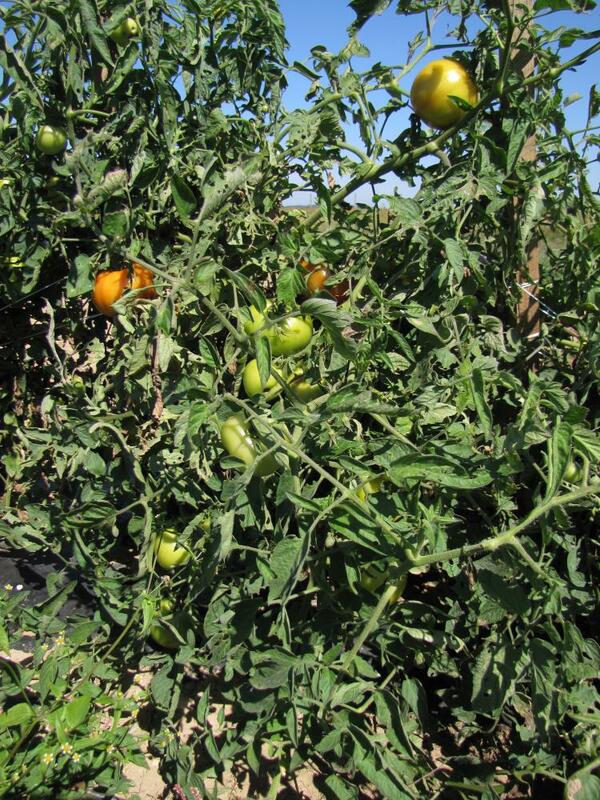 Late blight effectively managed with resistant tomatoes on Long Island in 2013 [Online]. Vegetable MD Online. Department of Plant Pathology. Cornell University. Available at http://vegetablemdonline.ppath.cornell.edu/NewsArticles/Tomatoes-LB-Resistant2013.html. (verified 7 March 2015). McGrath, M. T., Menasha, S. R., and LaMarsh, K. A. 2013. Evaluation of late blight resistant tomato cultivars and experimental hybrids on Long Island, NY, 2012. Plant Disease Management Reports 7:V021. McGrath, M. T., Menasha, S. R., and LaMarsh, K. A. 2014. Evaluation of late blight resistant tomato cultivars on Long Island, NY, 2013. Plant Disease Management Reports 8:V195. Nowicki, M., Foolad, M. R., Nowakowska, M., and Kozik, E.U. 2012. Potato and tomato late blight caused by Phytophthora infestans: An overview of pathology and resistance breeding. Plant Disease 96:4-17. (Available online at: http://dx.doi.org/10.1094/PDIS-05-11-0458) (verified 7 March 2015). Seaman, A. 2013. Video: Identifying and scouting for late blight on organic farms [Online]. eXtension Foundation, eOrganic Community of Practice. Available at http://www.extension.org/pages/68599/video:-identifying-and-scouting-for-late-blight-on-organic-farms#.U2q1LhBWVY0) (verified 7 March 2015). Stone, A. 2008. Organic Management of Late Blight of Potato and Tomato (Phytophthora infestans) [Online]. eXtension Foundation, eOrganic Community of Practice. Available at: https://www.extension.org/pages/18361/organic-management-of-late-blight-of-potato-and-tomato-phytophthora-infestans#.VPtZ1LPF9z8) (verified 7 March 2015). Seidl, A. C., Jordan, S. A., and Gevens, A. J. 2014. Novel late blight resistance in heirloom tomato cultivars and effectiveness of resistance in hybrid cultivars to isolates of Phytophthora infestans of the US-22, US-23, and US-24 clonal lineages. Plant Disease (accepted). Stone, A., and B. Baker. Organic management of late blight of potato and tomato with Copper products [Online]. eXtension Foundation, eOrganic Community of Practice. Available at: http://www.extension.org/pages/18351/organic-management-of-late-blight-of-potato-and-tomato-phytophthora-infestans) (verified 7 March 2015). USABlight [Online]. United States Department of Agriculture. Available at: http://usablight.org/managing) (verified 7 March 2015). Zitter, T. A. 2011. Known performance of tomatoes for late blight [Online]. Available online at: http://vegetablemdonline.ppath.cornell.edu/NewsArticles/NewsList.htm) (verified 7 March 2015). Johnson, A. C., S. A. Jordan, and A. J. Gevens. 2014. Novel resistance in heirloom tomatoes and effectiveness of resistance in hybrids to Phytophthora infestans US-22, US-23, and US-24 Clonal Lineages. Plant Disease 98(6):761—765. (Available online at: http://dx.doi.org/10.1094/PDIS-06-13-0674-RE) (verified 7 March 2015). McGrath, M.T., C. Smart, B. Gugino, A. Gevens, and P. Roberts. Late blight of tomato and potato: Recent occurrences and management experiences webinar [Online]. eXtension Foundation, eOrganic Community of Practice. Available at: http://www.extension.org/pages/70122) (verified 7 March 2015).